Great Stella and Stella4D provide most of the models from Fr. 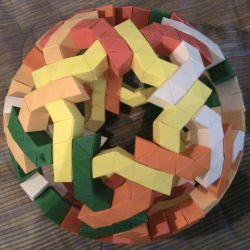 Magnus Wenninger's books Polyhedron Models and Dual Models, but what about some of the other interesting models to be found on Magnus's website? In particular, the hollow models based on spherical designs such as these are very appealing. Well, with a bit of work they can indeed be made in Stella. This tutorial describes how, and will focus on those two models in particular. Note: These models are complex. To prevent Stella from carrying out any unnecessary and lengthy operations during this process, I suggest closing any stellation or net views, and if the Info window is open, close the Stellation and Net tabs there too. Typically, start with an icosahedron and use "Poly→Create Geodesic Sphere" with whatever frequency you need. A bit of analysis and experimentation in Stella shows that the model on the left (in Magnus's photo) is based on a 14-frequency sphere, and the other is based on 12-frequency. Change all face colors to black ("Color→Set All Face Colors"). Display edges, since now it's all black! (Hit "e"). You may also want to change the edge color to show up with "Color→Set Edge Color". Enter Color mode (click on the palette icon). Shift+Right click to select a face, then hit Shift+C to choose a color for it. Shift+Left click on other faces to use this color on other faces too. Even hold down Shift+Left and drag the mouse along a path of faces which should receive the same color. I do this as long as colors follow the symmetry group. Otherwise use Ctrl instead of Shift above to color single faces one at a time (rather than all faces of same type). You can turn off edge display once a pattern emerges. The edges may just become clutter at that point. Set scale you want for model using one of the items from the Scale menu, e.g. "Scale→Base Polyhedron Radius". Put this in memory 1 (type "m1" or use "Edit→Put Model in Memory→Memory 1"). Set scale to slightly smaller size (this will represent the inner surface of the hollow model). Try selecting a black face and hit "h" to hide them. This gives you an idea of how it will look, and lets you judge whether you have the desired thickness between layers. Unhide them again when ready (hit "h" again). Put this new model in memory 2 (type "m2"). Enter Faceting mode and open a faceting preview window . Tick "Options→Maintain Reflexibility" if black parts follow reflection symmetries. Ctrl+Right click on each visible black triangle until all appear in faceting preview window. Hide whole outer layer so that we can select faces from the inner layer. Use "Display→Show/Hide One Part of Compound" to achieve this. Again, Ctrl+Right click on each black face until all appear in the faceting preview window. Create facets, in the faceting preview window, to connect the two layers together. As mentioned, we are creating the negative space of what we actually want here. See Faceting Mode in the manual for details about how to create facets. This is the slowest step as you have to click on the vertices of each required facet in turn. Create the faceted model (using Ctrl+Shift+F, "Poly→Create Faceted Polyhedron" or click on in the Faceting Preview window's title bar). If the lateral faces which connect the two layers should be all the same color, then change the color of the model to that color (Ctrl+Shift+C). "Edit→Add from Memory→Memory 2", and say yes to delete coincident faces in pairs. If you want the lateral faces to match the colors of their attached faces in the outer and inner layer, then select one of the lateral faces and use "Color→Take Color from Neighbouring Faces". With some magic, Stella should figure it out! And if all went well, voila! Well done if you followed all that! The reason for not faceting the positive straight away, rather than the negative, is that we want to retain the colors we drew on the sphere. Finally, these models have a great many facial planes, which causes havoc for stellation, so you probably won't be able to stellate these models. This also means you may not be able to create nets directly. If that is required, you may need to use Faceting mode to create simpler pieces of the model, for which nets can be generated.